Stone the cherries. Place in a small pan with the brandy. Simmer until 80 per cent of the liquid is absorbed and the cherries are very soft. Whisk together the mascarpone, cream and icing sugar until soft peaks form. Toast the flaked almonds until golden-brown. Make the custard: whisk the yolks with the sugar and flour. Split the vanilla pod and scrape out the seeds. Heat the milk with the pod. When the milk is just below boiling, slowly pour a third of it on to the yolk mix and whisk until combined. Add the rest of the milk, whisk briefly and return to a clean pan over a low heat. Stir until the custard thickens, take off the heat and strain. Leave to cool. Put half the sponge fingers in the bottom of 1 large or 8 small dishes. Pour on enough sherry to soften them. Now build up the trifle in layers: try some of the strawberries next, followed by some mascarpone cream, crushed amaretti biscuits, half the custard, more strawberries and some redcurrants, the remaining sponge fingers, the remaining custard and then a thick layer of cherries. 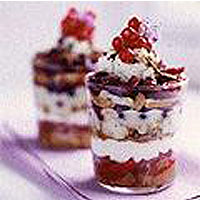 The top layer should be the rest of the mascarpone cream, the almonds, chocolate and any remaining red fruit. Chill for several hours, removing from the fridge about 30 minutes before serving.